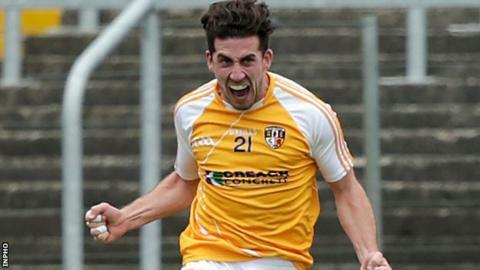 Antrim top the Football League Division Four standings after a 2-12 to 0-10 victory over Waterford at Fraher Field. Conor Murray and his brother Ryan supplied the goals for the Saffrons as they chalked up a second win from their two games. Antrim led 1-6 to 0-5 at the interval in Dungarven and came away with a comfortable two points. The cause was helped when the hosts were reduced to 14 men in the second half. Lenny Harbinson's side started the campaign with a 0-15 to 0-5 victory against Leitrim at Corrigan Park last Sunday. The Ulster side are in good shape for an immediate return to Division Three after relegation last season. Antrim are joined on four points by Laois and Carlow but they lead the way on scoring difference.